Well, I had the post set to be posted and apparently, it disappeared into space! Uggh! Sorry about that. So here without further delay is the answer. Q: What type of animal was the first to be launched into outer space? A: In 1947, fruit flied were launched, but only had a suborbital flight. 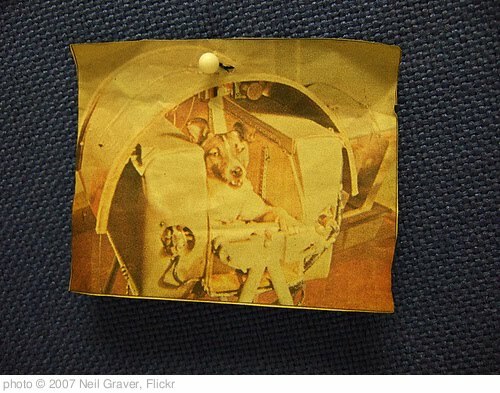 In 1957, a mix breed dog named Laika was the first animal to be launched into Earth’s orbit. Sent by the Soviets during the space race between the Soviet Union and US, this event caused riled animal lovers because there was no recovery plan for Laika. Because different sources list any of these as the first animal sent into space, if you guessed fruit flies, a monkey or dog, you will get an entry into the contest! See you next week for another chance to enter! It’s amazing how much history animals are involved in!